The recreational opportunities listed on Alsea Bay are brought to you by www.clamdigging.info for the benefit of the members of the Clam Digging and Crabbing community. The City of Waldport is located on the south shore of Alsea Bay. Old Town Waldport was built on the site of an Indian burial ground. Deceased Alsi Indians were interred in wooden canoes above ground. The early white settlers piled the canoes together and burned them. The City of Waldport set an example that other coastal communities should follow by building easy access steps over the riprap to the bay. The low and high salt marsh of the large island that separates the North Channel from the main channel is the most prominent tidal area in Alsea Bay. The large island becomes three smaller islands during high incoming spring tides. Click on the image to enlarge it. Do not boat in the lower Alsea Bay from the Highway 101 Bridge seaward durning the outgoing tide. Loss of life is a simi-annual event on Alsea Bay. The strong outgoing current carries disabled boats into the surf at the entrance to the bay and the cold ocean does the rest. The Grim Reaper claimed another boater in the lower bay several years ago last fall foolish enough to get caught in the lower bay at the wrong time. The Coast Guard called of the search for his body. Crabbing in the lower bay is dangerous during periods of the strong outgoing tidal current generated during clamming tides. Click on the image of Alsea Bay to enlarge it. On 4/14 Bill from the Dock of the Bay located at 1245 NE Mill St, Waldport, OR 97394 (541) 563-2003 reports, Crabbing from boats has slowed because the bay is flooded with freshwater. Forty seven crabs for six crabbers from a charter boat of a licensed guide. The crabbers ate twenty seven of the forty seven crabs. Crabbing from the beach at Bayshore with vinyl wired crab pots that were baited with chicken and left to soak from low tide through high tide to low tide. Crabbing from the Port Docks at Alsea Bay. Bill from the Dock of the Bay Marina and Store rents a boat, 3 crab rings with 3 baits for 3 hours for $80.00. Bill also cooks crabs for $9,00 a dozen and backs and cleans the crabs for an additional $6.00 per dozen. Diving for crabs in lower Alsea Bay during the time of abundance paid off. My daughter involved her boys in choosing which crabs to keep. The recipe for Oregon’s Crab Louie dressing is based on the ability to enhance the flavor of the ingredients of Oregon’s Crab Louie. The optional ingredients consist of Worcestershire sauce or Chipotle chili pepper sauce or fresh ground ginger. Either one of the optional ingredients adds a flavor component to Oregon’s Crab Louie that complements the delicate sweet flavor of the fresh crabmeat. 1. 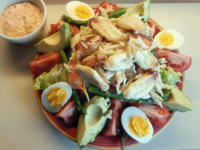 Oregon’s Crab Louie dressing is a combination of mayonnaise, catsup, hamburger relish and lemon juice mixed to taste. Add either one of the optional ingredients to enhance the flavor of the Louie Dressing. Add a tablespoon of Chipotle flavored hamburger relish or 1 plus tablespoon of fresh minced ginger to complement and enhance the flavors of the crabmeat and other ingredients. If the Chipotle flavored hamburger relish is unavailable add 1 minced Chipotle chili pepper to the three tablespoons of hamburger relish. Do not allow the flavor of the chipotle or ginger to overpower the dressing by using too much. Click on the following video clip to view a professional crab shaker picking a Dungeness crab. Using this method cuts the time to pick a crab in half. Click on the following links for additional information about taking crabs in the Pacific Northwest. Click on ODFW's website crab page or click on Washington State's information on recreational crabbing or click California's information on recreational crabbing. Click on Alaska's comments on Dungeness Crabs and on permits and regulations for SE Alaska. Click on Dungeness Crabs at Netarts Bay. Click on Species Profile for Dungeness Crabs PDF file. Click on Species Profile for Red Rock Crabs to view PDF file. Click on Dungeness and Red Rock Crabs to view information on taking crabs from Oregon's Bays and ocean water. Tidal Projections: View the tidal projections for Waldport, or view the tidal projections for Drift Creek . Click on Marine Weather forecast to view the marine weather forecast for coastal waters from Cascade Head to Florence OR out 10 nm. Click on Alsea River at Tidewater to display the height of the river level for the Alsea River – At Tidewater. Alsea Bay Clam Digging: not what is was at one time. ENLARGE THE PHOTOS TO SEE THE WHOLE STORY!!! In the not to distance past, my buddy Walt and I were into digging large gaper clams. However, clam digger Bret filled a 5 gallon bucket with 8 of his limit of 12 gaper clams. The best we could do was dig 4 of the big brutes. Our clam digging buddy and former CDAO Board Member Jerry dug the clams in the following photograph. He dug the gaper clams from the lower bay and the softshell clams from the tidal flat on the bayside of HWY 34 at Eckman Lake. Photo of clams by Jerry Lynch. Click on images to enlarge them. Shellfish and Estuarine Assessment of Coastal Oregon (SEACOR) for Alsea Bay. My friends, Please consider the following? Our response to ODFW's release of the SEACOR maps of Alsea Bay. Click on the images to enlarge them once and again to make them even larger. The lack of ODFW's clam management objectives for bay clams are responsible for the nearly total decline of the once amazing population of gaper clams from Alsea Bay. Photo No. 1 shows the SEACOR gaper clam and cockle population density in Alsea Bay as compared to what the population boundary shown in red at the time photo No, 2 was taken. Photo No. 2 demonstrates an all inclusive age class recruitment of gaper clams dug at the time the photo was taken. The 3rd photo taken the same time as the 2nd photo shows both gaper clams and softshell clams taken from Alsea Bay. During the time the photo No. 2 was taken the boundary in red delineated an amazing population of gaper clams. The population density was extremely high. Once this became common knowledge hundreds of clam diggers descended on the clam beds like a plague of locusts of biblical proportions. The majority of the clam diggers incorrectly identified the juvenile gaper clams as softshell clams and were digging 36 juvenile gaper clams at a time in addition to 12 adult sized gaper clams. The result by summer's end the gaper clams had been dug out. The CDAO asked ODFW biologist, Mich Vance to close the harvesting of gaper clams in Alsea Bay until the out of control clam diggers were brought in compliance with harvest regulations. Our request to ODFW was denied. We asked the Oregon State Police to enforce harvest regulations by issuing tickets to bring the out of control diggers into compliance. The OSP officer, Heather Van Meter walked through the digging area advising digger that they were mistakenly digging juvenile gaper clams rather than softshell clams and the limit was 12 and not 36. Once the OSP left the clam diggers resumed digging over limits of 36 juvenile gaper clams. Once the clam diggers mistakenly filled the 36 clam limit for softshell clams they turned their attention to digging limits of 12 each gaper clams. At the time both the ODFW and OSP failed to protect population of gaper clams from being overharvested by diggers digging 48 gaper clams rather than 12. Had the ODFW had a REAL clam management in place would there still be an abundance of gaper clams in Alsea Bay? Had ODFW had a REAL clam management would OSP have enforced and controlled the overharvest of gaper clams by issuing tickets? Would a REAL clam management plan result in a thriving abundance of gaper clams in Alsea Bay today? Who knows? Harvest regulations are not a clam management plan. Without a REAL clam management plan we will never know the outcome of out of control harvesting or inadequate harvest regulations. Mile by Mile Guide Between Alsea Bay and The Siuslaw River Estuary at Florence. 155.9 Alsea Bay South Shore access is gained by turning west into the beach access parking lot at the intersection of Highway 34 and Highway 101. The parking area is located behind the Historic Alsea Interpretive Center. The Historic Alsea Interpretive Center offers the visitor interesting exhibits on marine life. Take the stairway to the bay and pump for sand shrimp, fish for salmon during the annual migration or rake for cockles in this section of the bay. 156.6 William P. Keady Wayside access to the southeast shore of Alsea Bay is from the stairs built by the City of Waldport. Pump for sand shrimp or rake for cockles in this section of the bay. 157.1 Governor Patterson State Memorial Wayside is one the access point to the south shore spit of the entrance to Alsea Bay. Dig for razor clams along the sandy beach from the entrance to Alsea Bay to Yachats. 159.3 Beachside State Park is a full service State Park located north of Tillicum Beach and is a fair location to fish for redtail surfperch. The sandy beach above Yachats is listed by ODFW as a location to dig for razor clams. 160.5 Tillicum Beach is a full service State Park located 3.5 miles north of Yachats and is a fair location to fish for redtail surfperch and a good location to dig for razor clams. 163.6 Smelt Sands Beach is located .7 of a mile north of the Yachats River Bridge and is home of the 804–beach trail. The trail provides excellent access to the rocky shore. The rocky beach is famous as the location where smelt are caught by dipping nets into the tidal surge to catch the spawning smelt. The smelt run during July. The area is an excellent location to fish for perch, sea trout, bass, cabezon and lingcod. The rocky shore from Smelt Sands Beach south along the coast to Strawberry Hill offer anglers some of the most productive locations along the Oregon Coast that consistently produce fine catches of bass, sea trout, perch, cabezon and lingcod. 164.4 The Yachats State Park is a day use park located in Yachats. To access the park turn west on 2nd Street or west on Marine Drive 163.8. The fishing for perch, sea trout, bass, cabezon and lingcod is excellent. Refer to the Oregon Sport Fishing Regulation restricting the taking of shellfish or marine invertebrates within the Yachats Marine Garden. The area is not only popular with surfers and anglers but is ideally suited for most recreational activities. 165.7 Yachats River, located in the town of Yachats is a productive winter steelhead river with access to public properties from a county road bordering the stream. It offers good catch-and-release opportunities for wild steelhead from the forks down to tide water. Chinook Salmon return to the Yachats River as early as late September peaking in mid October before declining toward the end of November. Cutthroat trout return to the Yachats River from late July to early November. 164.8 The Yachats Ocean Beach Wayside is an access road that parallels the rocky shore for .5 of a mile. To access the Wayside turn west onto the access road immediately south of the Yachats River Bridge. The fishing for bass, cabezon, greenling and lingcod is excellent. 166.9 The Devil’s Churn is just north of the visitor center and 2.7 miles south of Yachats. Park at either the visitor center or in the turnouts along Highway 101. The best fishing is on the rocky area south of the Devils Churn. The fishing for perch, sea trout, bass, cabezon and lingcod is excellent. 167.1 Cape Perpetua Auto Tour is a short drive to the top of the Cape. The view on a clear day is absolutely breath taking. The basalt monolith rising 803 feet above the ocean shore is the highest point immediately fronting the ocean below on the Oregon Coast. The view from the top is a challenging reward for those with the energy to hike the trail to the top. 167.3 The Cape Perpetua Visitor Center is located 1 mile north of Neptune beach. There is a vehicle access fee to park in Cape Perpetua Recreational Area. There is ample parking for all vehicles at the visitor center and limited parking available along highway 101. Follow the hiking trail down to the rocky shore. Fish from the rocks south to Cook’s Chasm. The fishing for perch, sea trout, bass, cabezon and lingcod is excellent. The taking of shellfish and invertebrates within the Cape Perpetua Marine Garden is closed except for the excellent digging of razor clams and the taking of a single mussel for fishing. There are 26 miles of hiking trails that take visitors to areas of incredible beauty and vistas that are truly inspirational. The center provides visitors with a wealth of information and displays about the daily lives of Native Americans. The history of Cape Perpetua and the surrounding area goes back 5,000 years. Credit for discovering Cape Perpetua belongs to Captain James Cook on March 7, 1778. Captain Cook named Cape Perpetua in honor of St. Perpetua, an early Christian who was murdered on March 7, in the year 203. The information provided by the Visitor Center can only enhance the quality of your trip. 168.0 Cook's Chasm south of Yachats is the location of Thor's Well and the Spouting Horn located on the ocean side of Hwy 101. Plan to arrive during the last half of the incoming tide when the long ocean swells are rising. Be aware of sneaker waves can surge over the basalt shelf. 168. 2 Neptune Beach is located 3.6 miles south of Yachats and is a good location to fish for perch, sea trout, bass, cabezon and lingcod. Refer to the Oregon Sport Fishing Regulation restricting the taking of shellfish or marine invertebrates within the Neptune State Park Reserve. 168. 5 Neptune Beach has two parking lots. The parking is limited on both locations. There is a restroom located at this one. Neptune Beach is a good location to fish for perch, sea trout, bass, cabezon and lingcod. The sandy beach associated with Neptune Beach and the Cape Perpetua Visitor Center offers excellent digging for razor clams. 169.3 Strawberry Hill is located north of the Bob Creek Wayside and south of Neptune Beach 5 miles south of Yachats. There is excellent fishing for all rockfish species from the rocky ledges and for striped seaperch from the beach. Cummings Creek (located approximately 4 miles south of Yachats on Hwy 101) is a smaller stream located in the Cummings Creek Wilderness area. Anglers can have fair to good wild winter steelhead fishing in a secluded old-growth setting. 170.0 The Bob Creek Wayside is located north of Searose beach. There is a fairly large sea cave under the Bray's Point overlook. The fishing for sea trout, bass, cabezon, lingcod and striped seaperch is good. 171.3 Ten-Mile Creek (located approx 6 miles south of Yachats on Hwy 101) consistently produces good catches of wild winter steelhead when conditions are right. Much of the creek-side property is in private ownership. Occasional hatchery steelhead strays also can be caught. 171.3 Searose Beach is located between Stonefield beach and the Bob Creek Wayside. The fishing for striped seaperch and redtail surfperch is good. Access is gained by parking at the pullout located on the north side of the Tenmile Creek. 171.5 Stonefield Beach State Wayside is located just south of Tenmile Creek. The fishing for redtail surfperch is good. 172.6 Tokatee Klootchman State Wayside beach access. Big Creek is located 8 miles south of Yachats and provides good fishing in Winter as steelhead move into the river at high tide. A good road borders the stream and most areas are owned by the US Forest Service. Occasional hatchery steelhead strays also can be caught. 173.9 Rock Creek Beach is a sandy beach located between the rocky beaches of Roosevelt and Stonefield. Fishing for redtail surfperch is good. 175.3 The Muriel Ponsler Wayside has limited parking. 176.0 The Carl G. Washburn State Park is a full service park and is located south of the Muriel Ponsler Wayside. The fishing for striped seaperch is good over the rocky beach. China Creek is named after the coolies that worked in the creek for Gold. 177.2 Trailhead parking for access to the China Creek Trail, the Valley Trail, the Hobbit Trail and the trail to the beach is from a turnout on the eastside of Highway 101. 178.2 Devil’s Elbow is located between Cape Creek and Heceta Head. The entrance to the parking area for the Devil’s Elbow and the Heceta Head Lighthouse is located immediately south of the service entrance to the lighthouse. The lighthouse was built in 1884 and it cast a light 21 miles seaward. The lighthouse is the most photographed landmark on the Oregon Coast. The best location from which to photograph the lighthouse is from one of several turnouts on Highway 101 south of the Devil’s Elbow. The ghost of the lighthouse keeper’s daughter is rumored to walk the halls of the light keeper’s house, however, during an interview it was reveled the tale of the lighthouse keeper's daughter was a hoax.. Heceta Head is named after Spanish Explorer Bruno Heceta who discovered the headland in 1775. The fishing for pileperch, striped perch, sea trout, shallow water rockfish and lingcod is excellent during spring from the basalt rocky shelves that are only exposed during an outgoing tide or at low tide. 178.2 Cape Creek can provide good fishing as steelhead on the incoming tide at high tide. 179.2 The Sea Lion Cave is one of the most popular attractions on the Oregon Coast. The cave was discovered in 1880 by retired sea captain, William Cox. Captain Cox entered the cave from the ocean by skiff and found himself trapped inside the cave by a storm for several days. 181.2 Baker Beach overlook is located on the turnout on Highway 101. The view of Baker Beach in the foreground and Heceta Beach, the jetty at the mouth of the Siuslaw River and the Oregon Dunes National Recreational Area in the background give promise to the unlimited recreational opportunity. Follow the stairs to access the trail that leads to Baker Beach below. 182.2 Baker Beach as pictured above is located north of Florence and is accessed by turning west onto Baker Beach Road from Highway 101 or via the footpath from the overlook on Hwy 101. Baker Beach is a good location to fish for redtail surfperch and to dig for razor clams south to Heceta Beach. Equestrian enthusiasts are welcome at Baker Beach. The beach is so popular with equestrians, on weekends, that it is difficult to find a place to park. 185.4 Sutton Lake Recreational Area is a full service recreational area located north of Florence and is accessed by turning west into the Sutton Lake Recreational Area access road. The beach is a good location to fish for redtail surfperch and to dig for razor clams. 187.3 Heceta Beach is located at Florence via Heceta Beach Road 3 miles north of the junction of Highway 101 and Highway 138 or from any of a number of streets in Florence. Park at the end of the road at the North Jetty and walk to the beach or drive to the Driftwood Motel park at the public easement and walk to the beach. Dig for razor clams south toward the north jetty or northward along the beach. At one time Heceta Beach had an excellent reputation for digging razor clams and for surf fishing for redtail surfperch. The city of Florence was named after the three–masted bark Florence, which sunk offshore during a storm in November 1875.